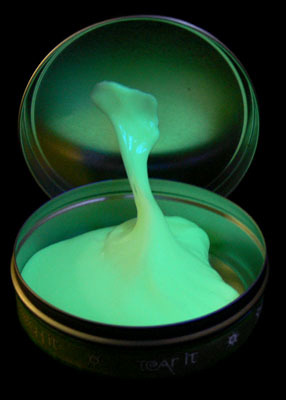 Krypton Glow in the Dark Putty is hypnotic and irresistible!. Milky white in daylight, the glow appears when the lights dim. Use any bright light to charge up (the brighter, the better). You can do cool effects with it by 'drawing' on it with a penlight or shade areas with different shapes before exposing to light. After exposure to light, the putty will glow for hours. If you illuminate Krypton Putty with a Blacklight, it will glow at full brightness for as long as the light remains on. Endless fun. Never dries out. Putty is Non-Toxic, CPSIA compliant, safe for children, and Made in the USA. Putty comes packed in a metal tin as shown. Contains about 1/5 pound of putty.